New Hampshire Youth Lacrosse Association has been chosen as the first U.S Lacrosse State Wide Program to team up with Play4TheCure! Play4theCure is a fundraising platform for the National Foundation for Cancer Research, which provides funding worldwide to the best scientists to enable cutting edge research that other large cancer organizations can’t and won’t fund. 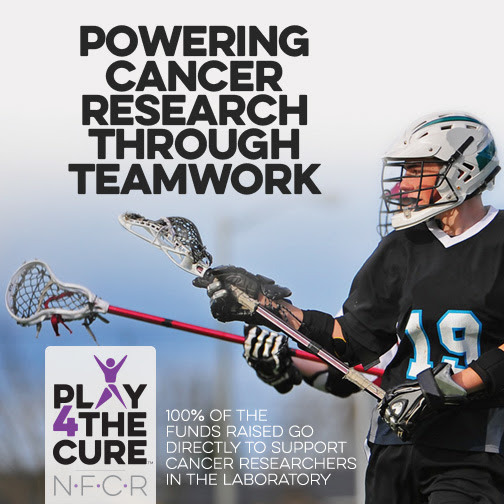 Play4theCure inspires young athletes and their teams to leverage their passion for sports to “Play4” loved ones affected by cancer and encourages them to actively participate in working to fund cancer research to make a difference. Click HERE to visit the NHYLA page and follow the instructions to find NASHUA BLAST. Click HERE to go straight to the Blast donation page. Raise money as a team, or as an individual. Check out the "PLAY4THECURE" video HERE.